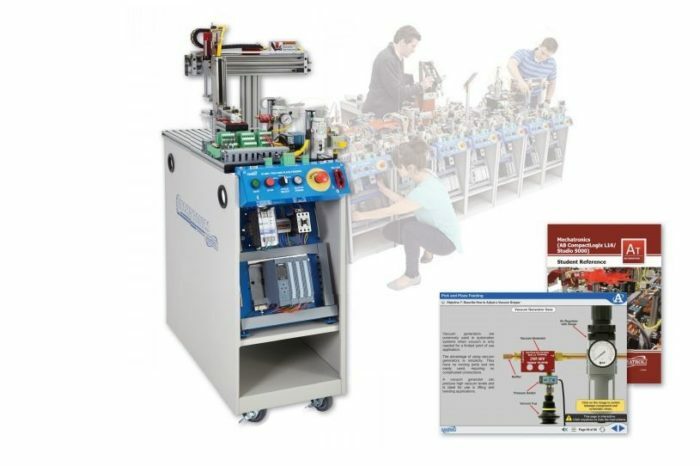 Amatrol’s 87-MS1, Pick and Place Feeding, is station 1 of the 870 Mechatronics Learning System. The 87-MS1 station is a small mechatronics system in itself with multiple, integrated technologies that can be used stand-alone or in combination with other stations. Industrial safety and operation are emphasized on all Amatrol mechatronic stations. The Pick and Place Feeding station teaches interfacing, problem solving, programming, sequencing and operation for pneumatic robots, material feeding systems, powered parts feeders, vacuum grippers, hall-effect sensors, and magnetic sensors. This station starts the process of assembling a working industrial directional control valve. The 87-MS1 is a mobile workstation with slotted work surface that contains an operator station, powered feed module, pneumatic pick and place manipulator, finished parts storage module, parts set, a pneumatic distribution module as well as an electrical distribution module, an electro-pneumatic valve manifold, and a digital I/O interface module. Amatrol’s unmatched multimedia utilizes text, audio, and stunning 3D animations that engage learners in both theoretical knowledge and hands-on skills. This thorough, exceptionally detailed curriculum is built to begin with the basics of material feeding and handling systems and steadily advance to more complex concepts and skills. Through partnerships with key industry leaders and leading edge educators, Amatrol developed the right balance of knowledge and applied skills needed to train learners to work in their chosen field.